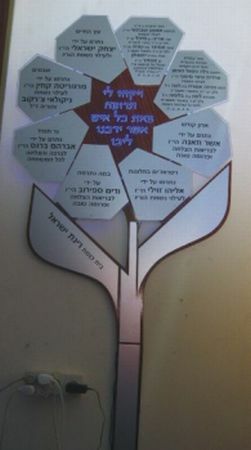 Donors tablets are one of the most popular products that our customers look for nowadays when it comes to synagogue decoration or public ceremonies. There are not that many suppliers around the world, but the top one today is our company: Or-El. We have a very advanced new website: www.or-el.co.il/len/. There are many products that we pride ourselves in offering to our clientele. You should learn more about the different donors tablets that we have available to purchase, because they can open up your imagination. For example, prior to a detailed search of our new website: www.or-el.co.il/len/, you may think of buying a different style of donors tablets. Conversely, once you have had a good search on our site, you will understand what you've been missing. The advanced technology that we have used to make the donors tablets that are available from us make it all the better reason to buy for whichever purpose is necessary. This is why when it comes to design and decorative merchandise for synagogues; we are the number one destination. We at Or-El always make sure that the donors tablets we sell provide the safest LED lighting out there! We provide this great feature with our other top products too. The LED lighting which we provide with all donors tablets consumes less power, has higher life expectancy, and provides higher-intensity and better distributed lighting and heat. The technology we use also aligns with standards that have come into effect within EU countries. Due to the fact that we provide one of the largest databases of its kind, many new customers have reaped all the benefits of the great donors tablets that come out each month at Or-El. The great thing is that you can buy merchandise from us either online and offline, meaning that you can have a detailed online search about our special products prior to visiting our store. So if you are interested in all the best donors tablets and other superb products we have, don't hesitate to visit us in Tel Aviv today.